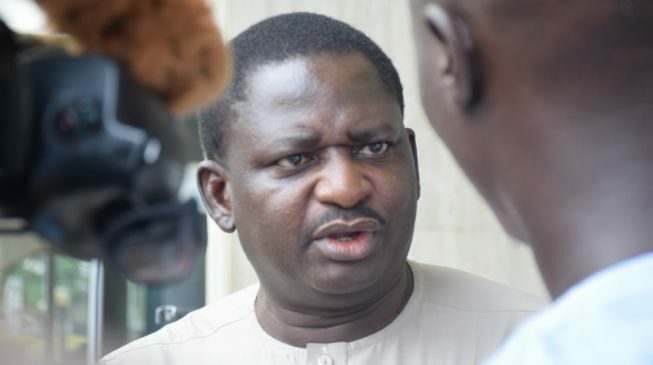 Femi Adesina, spokesman to President Muhammadu Buhari, says his principal’s opponents will fall ahead of the 2019 elections. Adesina said this on Thursday shortly after ex-President Olusegun Obasanjo endorsed Atiku Abubakar, the Peoples Democratic Party (PDP) presidential candidate. Abubakar, seen as Buhari’s main challenger in the elections, received Obasanjo’s blessings when he met the former president alongside other prominent Nigerians, in Abeokuta, Ogun state, on Thursday. Obasanjo, who has been a strong critic of the Buhari administration, said Abubakar has the capacity to perform better than Buhari if elected into power. But writing via his Twitter handle on Thursday, Adesina said the harder Buhari’s opposition come, the harder they fall. “The harder they come, the harder they fall. 2019 presidential election on my mind,” he said. The harder they come, the harder they fall. 2019 presidential election on my mind. Reacting, Femi Fani-Kayode, another critic of the current administration, replied Adesina, saying “we shall meet om the field”. The 2019 election is a two-horse race between Abubakar and Buhari.